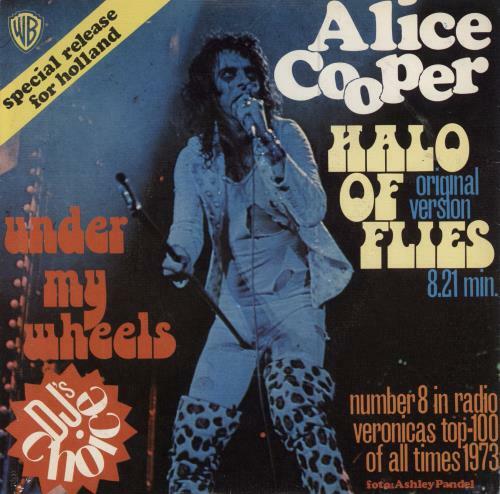 ALICE COOPER Halo Of Flies (Rare 1973 Dutch only wide centred 7" vinyl single that plays the full 8:21 Version of the title track, with Under My Wheels a worthy B Side. This single was released exclusively in Holland as a result of the track being voted as the number eight all time favourite in a 'Top 100 ' run by the Netherlands Radio Veronica, unique textured picture sleeve. The sleeve shows a few of the ravages of time with a little creasing to the top & some edge scuffing, but no major wear. The vinyl remains in excellent condition, although I'm not too sure about trying to cram over eight minutes onto one side of a seven inch! WB16296).